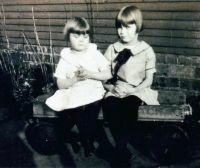 Margaret Senter Peck with Mary Lois Peck in her lap. Harry Howard family and bus in Salt Lake City. 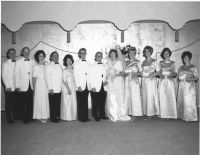 When David married Susan in Salt Lake City- UT- Harry & Mary bought a bus and took the entire family up for the wedding. This photo was the headline photo in the living section of the Deseret News, Salt Lake City, June 1965. 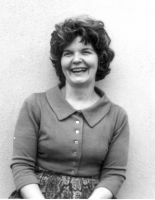 Mary Howard in March 1966. Harry & Marry Howard family photo taken December 1967 for Christmas card. 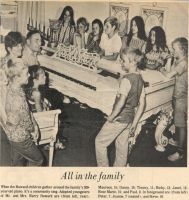 Photo taken in Howard home in Pasadena, California. Standing L-R: Janet, Rick, Tommy, Mike (Joe), Rosemarie, Kathy, Sarah, Mary, Bonny, Fred, and Lisa. Sitting L-R: Joanne, Peter, Paul, Stevie, Danny, Timmy, Mary, Harry. Bobby, David, Liz and Joe are not in the photo they were all married. Harry & Mary Howard- on the beach in Laie- Oahu- Hawaii- a short distance from their home- May 1974- he just turned 55 and passed away the next month. He was in great shape except for his heart.